Political observers are starting to come around to the idea that the New Democrats might actually have a shot at winning, and that the 43-year-old Progressive Conservative dynasty might actually come to an end. But old habits die hard and everyone has been burned before, so you won't get much more than a 'might' out of anyone. Two new polls make it very, very hard to argue that the New Democrats have anything but a comfortable lead in the Alberta provincial election. The projection agrees, and has now bumped the NDP up to 39% support from 35% post-debate. Their seat haul hasn't changed much (they may be running up against their ceiling), with a range of between 28 and 47. Their range was 26 to 45 seats before. The main shift has been between the PCs and the Wildrose, who have switched positions. The Tories are up four points to 29%, and could win between 17 and 45 seats (up from five to 31). That is a dramatic shift, and does now make a PC minority victory plausible. But it would require the NDP to come down a bit to the benefit of the Tories. Wildrose has fallen sharply, by seven points to 25%. They are now projected to win between 11 and 22 seats, down from a range of 25 to 42 seats. The New Democrats made their biggest gain in the 'rest of Alberta', going from 28% to 32% in the projection. The Tories were also up in the region, by six points to 32%, while Wildrose plummeted 10 points to 32%. It is a very close race in the heterogeneous region outside of the two main cities. Not so in Edmonton, where the numbers have held steady. The NDP is ahead there with 57% to 21% for the PCs and 15% for Wildrose. In Calgary, the Tories picked up three points to move into a narrow lead with 33%, followed by the NDP at 29% (+1) and Wildrose at 27% (-4). The two new polls out this morning are from firms that have not stepped into the campaign just yet. That makes it impossible to look at trends, but gives as some extra data points to compare to the numbers we've been from others. The Return on Insight poll for the CBC showed the NDP leading very comfortably with 38%, followed by the Tories at 24% and Wildrose at 21%. The Léger poll for the Calgary Herald and Edmonton Journal also put the NDP at 38%, with the PCs at 30% and Wildrose at 24%. That both polls put the NDP at 38% shows that the party is indeed making some very significant inroads. Forum Research also had the NDP that high around the debate, while an EKOS poll that is forthcoming today will also show similar levels of support for the party. The two polls also show the PCs moving into second place and Wildrose dropping into third, which is an interesting development. It certainly makes for a photo-finish. The PCs do seem to be rebounding. Whereas before Wildrose and the NDP appeared to be squeezing out the PCs, these new trends suggest that there could be a coalescing of an anti-NDP vote (in practice if not necessarily in motivation) that could boost the PCs by election day. But it will still be a hard slog. The Léger poll found one-third of respondents choosing Rachel Notley as the best person to be premier, with Jim Prentice at only 24%. Brian Jean, at 11%, seems to be falling out of contention. The population hasn't soured on him as much as they have on Prentice, however. Léger found that just 10% say their opinion of Prentice has improved over this campaign, compared to 51% who say it has worsened. Jean, by comparison, has a 17% to 26% split on the question. For Notley, 47% of Albertans say their opinion has improved, and just 9% say it has worsened. As long as the NDP can get their voters out, it doesn't seem like they are at considerable risk of shedding support in the final days of the campaign. It could come down to, then, what happens with the PCs and Wildrose. The two polls also painted a broadly similar portrait of the regional breakdown, particularly in Edmonton. The NDP had 56% in the Léger poll, 57% in the RoI poll. For the Tories, that was 21% and 19%, respectively, and 16% and 11% for Wildrose. Calgary was a close race for both pollsters, with the Tories in first (32% to 33%), the NDP in second (25% to 30%), and Wildrose in third (24% to 26%). There was a bigger discrepancy in the rest of Alberta. RoI had the NDP at 34%, Wildrose at 28%, and the PCs at 22%. Léger, by comparison, had the PCs at 35%, the NDP at 30%, and Wildrose at 29%. The point of contention was primarily in terms of PC support - and that could mean a lot of seats. The Return on Insight poll, for example, would result in about 44 seats for the NDP, 22 for the PCs, and 18 for Wildrose. That puts the NDP just above the majority mark, primarily due to the PCs' poor showing outside of Calgary and Edmonton. The Léger poll, though, would give the PCs 41 seats, the NDP 35 seats, and Wildrose nine seats, pointing to a Tory minority. This is primarily due to the strong performance of the PCs outside of Edmonton and Calgary. This demonstrates the problem the NDP might have on election night. Their vote is not nearly as well distributed as it could be, and they might fall short of winning the most seats even if they are up on the Tories by as many as eight points. The seat result on Tuesday night could be very counter-intuitive. Its Alberta, at the end of the day, pc will win. EKOS will also be releasing a poll today. Interested to see the regional results when the poll is released. Reading this poll it appears FEDERAL Liberal supporters are streaming en masse to the Alberta provincial NDP for this election. This is very similar to how it's been in Manitoba for decades. The Liberal Party is dead provincially, so the large majority of any non-Con vote naturally flows to the NDP....giving them a majority. If this happens in this election, it'll be interesting to see if it holds for future elections ...as it has, for decades, in Manitoba. This could very well be a sea change election - not just for Alberta but for ALL of Canada. Indeed, this is shaping up to be the most interesting election with political repercussions that will reverberate across the country! Federal Liberal supporters "streaming en masse" to the NDP? Slow down cowboy, the Liberals only garnered 9.3% of the vote in 2011. This could very well be a re-alignment election for Alberta and the re-establishment of a two party system but, don't confuse Federal and provincial politics. Trudeau and Mulcair have wisely kept far away from Alberta during the campaign as has Harper. Alberta will probably become a two party or a two party plus system like every other province, their dominant party system was an anomaly not just in Canada but throughout the Commonwealth and Western world. I doubt there will be much reverberation since Alberta is only catching up to the rest of Canada and late 19th century politics and political norms. 40% of the popular vote would likely mean more than just 44 seats for the PCs I'd think. Just to clarify on my earlier comment - I don't think Calgary will take the plunge and vote NDP. I agree with you Ryan - the PCs could end up with 50 seats after the dust settles. I personally feel most of Calgary and half the Capital Region are going to stay with the PCs. This gives them 30-35 seats in the 2 big urban areas. Factor in a few wins in the Rest of Alberta (given that it's shaping up to be a 3-way dogfight here) and the PCs could easily end up with 44 and possibly 50. Calgary will undoubtedly elect a couple Liberals, Joe Ceci will likely take Calgary-Fort for the NDP and Wildrose could do well in the City. I agree Calgary is unlikely to vote NDP en masse and that is probably good news for the PCs. Edmonton on the other hand will I think turn mostly oprange, it will not be a sweep though. Blakeman will win in Edmonton-Centre and the PCs will salvage 3-6 seats in the Capital region. A coalition government in Alberta would have interesting implications federally. I would think the Wildrose would be likely to prop up the PCs too, no? Or is the anti-PC sentiment strong enough for them to allow the NDP to govern? I don't think any party in Alberta has any incentive to form a coalition government. PC's won't want to give the Wildrose any experience in the Executive (can't oogly-boogly them as inexperienced anymore) or the NDP ("don't give the socialist hordes power!... we'll give them power for you!") the incentives all lay in just allowing whomever wins the plurality to govern as a minority and take another kick at the can next year. A coalition is very unlikely for the same reason it is unlikely federally. The PCs in Alberta and Liberal party federally, will not want to give Wildrose and NDP governing experience thereby turning them into "governing parties". NDP governing with the PCs would be a poison pill for both. WR supporting PCs would be a poison pill for them (WR) as well, but would probably be the true end for the WR as people would see how indistinguishable their policies really are in practice. Bernard - there's the confidence and supply agreement in Ontario in 1984 to point to, and there was a Liberal NDP coalition in Saskatchewan recently. The seat ranges no longer make a coalition government plausible though. I will be extremely disappointed in Albertans if they swing back toward the PCs, even to the extent that these polls show. There's no way the PCs should finish better than third in this election. They've done nothing to warrant any continued support from anyone. The ThinkHQW numbers make me happier. I don't want the PCs as official opposition. Ideally I'd like to see them reduced to fewer than 10 seats. Well the NDP have pushed the PCs back into second. As I wrote before the appearance of a NDP government was the only thing that could resurrect the PCs and a flailing campaign. Hopefully we'll get another poll or two before election day to confirm or muddy the waters. At this point I will stick with my WR majority government prediction but, I think the numbers will be significantly different than what the averages and polls currently display. Another bad election for pollsters. There's no way Brian Jean will be premier. Of course. Brian Jean has the momentum. 60+ seats for the Wildrose! By the way, does anybody recall what his position on taxes again? He was not clear during the debate. I think the opposite of the 2012 election will happen but it may create the same result as the 2012 election, since NDP are in majority territory voters to the right of the NDP will pick one party most likely the PC's to prevent it. The juggernaut is this : people are disgusted and fatigued with the PCs and want to see them out, and Wildrose/Jean have proven themselves in this election too weak to promote to defeat the NDP. The momentum is with the NDP, and there's not enough incentive to back either of the other two parties to prevent them from getting into power. We might have the same result as 2012 but in reverse. 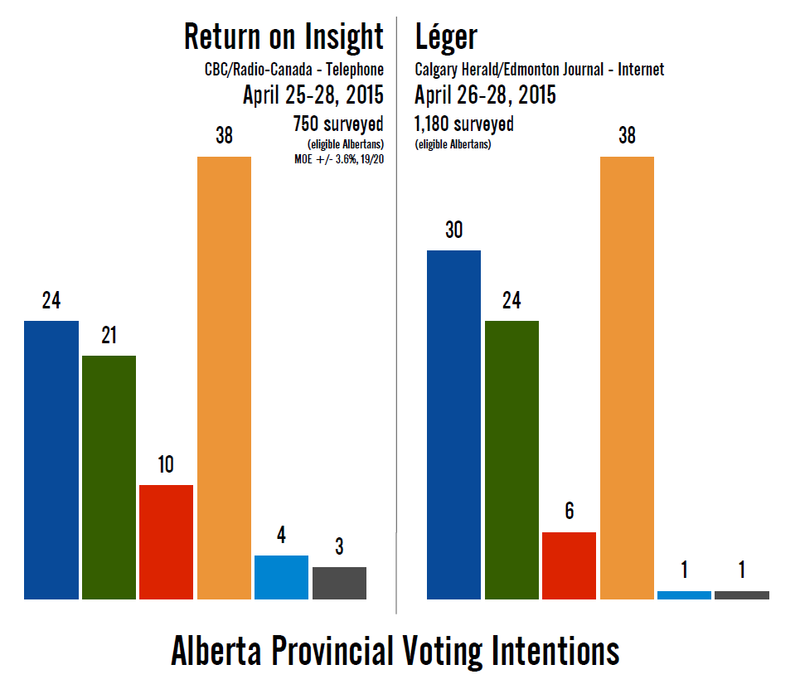 Over the weekend the right might talk about strategic voting to prevent an NDP majority. If so the PC's will likely benefit the most. This election is different... no "lake of fire" type bozo eruptions, threats on the left and on the right, mini-scandals for the Tories, unpopular budget. I just don't see the same dynamic happening this time that happened last time. Thanks Eric...The die has been cast, the NDP will win Albert`s Government, probably be a minority win, however, if polls continue along this trend line, it may be a majority NDP win...I`m gobsmacked!! !...I really am gobsmacked.. So, over to you Eric....How do you think a NDP government in Alberta will affect the federal election..
1) Will those who voted provincially for the NDP also do so federally..? Because, if Alberta is mad(rightfully so) at the PC`s over policy, policy that favors the corporates and elites, wouldn`t they too be mad at the Harpercons, same policies favoring corporates and the wealthy..
Methinks an NDP win in Alberta changes the entire dynamic of the federal election..
One could easily extrapolate that a NDP win provincially in Alberta would translate into riding losses for Harper in the federal contest..
After all, Jim Prentice and Harper...Dirty birds of a feather, do stick together. Hypothetically, let's say the NDP win this election in Alberta. I don't think it has too much of an impact on the federal race. Maybe a bit of a bump in Edmonton, but that's about it as far as the party's federal hopes go. What you need to understand is that people have been unhappy with the provincial PCs for years now, whereas Harper's party has been able to retain majority support for the most part. Prior to this campaign race, general consensus seemed to be that the federal Liberals had a lot more momentum in Alberta than the NDP. Interesting to see if anything has changed. Six seats for the NDP in Alberta is out of the question though IMO. I think you've misdentified why Albertans are angry at Prentice. It's about honesty and corruption and waste, not being business-friendly. "It's about honesty and corruption and waste." Interesting how the same can be said at the federal Tory level, yet the Conservatives are only down (at this point) about 10% from their norms in Alberta. The PC vote is evenly spread and absolutely inefficient in my simulator. The NDP, being so dominating, gets a majority. The WR benefits from the PC's ineffectiveness and hold on to the official opposition title. So the newest polls increase the NDP lead and diminishes the number of seats for both WR and PC. That is becoming a very surprising elections and one wonders if a 2012 turn-about will about come election day or if a (orange) wave of change is truly sweeping Alberta this time. Surprised at the number of commenters who still think the PCs will return to government after the next election. I guess there is a lot of skepticism with the polls. Plus it can be hard to believe that Albertans will ditch the 44 years of PC government for the NDP. But I believe the polls are right and the NDP is poised to govern Alberta. The question now is whether it will be under a minority (most likely) or majority government. 1. The PC party and Prentice's personal approving ratings are lower than their 2012 campaign with Redford. 2. In 2012, the PCs had a last minute campaign boost after the "bozo remarks" by some Wildrose candidates. Not only did it allow progressives to ditch the Liberals and NDP for the PCs, but some conservatives who parked their vote with the Wildrose went back to the PCs. There does not seem to be any widespread fear of the NDP or its policies. The media and the business community seem cautiously open to a potential NDP government. 3. The NDP has momentum. There is no sign of a PC or Wildrose surge in the final days of the campaign. This is contradictory to the 2013 campaign in BC where the NDP had a lousy campaign and the Liberals had the momentum despite trailing in the polls. 4. Criticism of the NDP's economic policies from the PCs are not working as well as they want too. It got to the point where front bench PC Thomas Lukaszuk was calling for a corporate tax hike. 5. Anti-NDP vote split evenly between the PCs and Wildrose. Some polls show the PCs are second place. Other polls show the Wildrose are second place. Hard for a small-c conservatives en masse to go to one party to block an NDP government. Besides, a lot of conservatives are pissed at the PCs and rather have the NDP over another term of PC. At this moment, I will be predicting. I realize I am a very small cog in the scheme of things but I am PC party member who went to the advance poll and voted NDP in Whitemud. (My partner joined me in voting NDP.) Not because I think the PC policies are particularly bad and the NDP's good (we think neither), but because we want very badly to defeat Mandel. I'm not particularly worried abut either a NDP or PC minority government. Anyway, we cast our vote they way we did and let's see what happens. I think we'll see the NDP virtually sweep Edmonton, and the Wildrose & PCs in a close battle in "TROA", with a few 2nd-tier city seats, like Lethbridge-West, perhaps going NDP. The election will be decided in Calgary, where the PCs are still strong, but Wildrose are a threat and the NDP are gaining ground. The wild card, as in every Alberta election, is obviously voter turnout. IMHO, a low turnout favours the PCs, because the rage factor is not in play. This is similar to the overall project here, and indicates a minority is likely, with either the NDP or PC as front-runners. It will be interesting to see if there are any late breaks one way or another, but without being overly partisan, I for one hope that current momentum continues! Wouldn't it be ironic if the NDP win a minority and the Liberals' 2-4 seats, and who are apparently in disarray in Alberta, make them the holders of the balance of power. Either way, it looks like for the first time since 1935 that a centre-left party will govern Alberta. Alberta politically is catching up to the province's shifting demographics (i.e. there are more non-whites of European & American descent of Protestant puritan and/or evangelical origin, who are very socially conservative). Here's an interesting tidbit: Albertans have NEVER voted in a minority government since entering confederation in 1905. Alberta has only ever switched governments 3 times since joining its inception, and every time it was a party to the right of the government that won. If the NDP wins, it will be the first time that the government has lost to someone on their left. The PCs were to the right of the Socreds? I find it hard to characterise the United Farmers as being to the right of the Liberals they replaced. Brennan - That's another good point. Also, the Socreds as they were in 1935 are extremely difficult to place on the left-right scale. On social issues they were conservative (with Bible Bill defeating a party whose leader was caught in an adultery scandal), but on fiscal issues they were proper social credit, which is a fairly far-left idea by modern standards (and also requires control of the monetary system, which Alberta didn't have). United Farmers were both left and right. They promoted agrarianism and were to be simplistic, anti-industrialisation and anti-urbanisation. They promoted farmers and a rural way of life through a variety of socialised and socialist policies. Alberta didn't "join" Canada. The Northwest Territories were given to Canada in 1870 when the HBC transferred Rupert's Land and the NWT to the Crown, the Crown then transferred these lands to Canada. Alberta was created by an Act of Parliament as was Saskatchewan just as Canada was created through an Act of the Imperial Parliament. The idea of "joining" is a very American notion and pre-supposes or at least infers these jurisdictions possessed a degree of sovereignty before creation as provinces. They did not hold sovereignty although, the Aboriginal people who inhabited most of the Land are today considered to have possessed some degree of sovereignty. Why an NDP victory would have a profound effect on the federal election scene. Such a thing would show not only Albertans, but Canadians generally, that there are options beyond the traditional two parties. It would show the whole country that Harper is vulnerable in his supposed stronghold. It would show that even apparently immovable weights can be moved with a wave of inspiration and support. I'd expect an NDP victory - particularly a majority win - to recast the federal scene completely. Alberta will only be catching up to 19th century political norms-a two party system. Most Canadians are able to differentiate between federal and provincial politics and the NDP still has their largest detriment federally, Mulcair. I wouldn't expect a NDP win much less such a win would have a dramatic impact upon federal politics. That EKOS poll is a little bit of a shocker. Sure, the NDP at 42% is big, but the fact than men prefer the NDP over woman by five points is the big surprise there. The NDP traditionally tend to do better with female voters. 45% of male voters in Alberta support the NDP according to this poll. PCs will rally in the last week as attack ads against the NDP prove effective. I understood we'll be getting another Mainstreet poll later this morning. That will be interesting to see, since they're the ones who have consistently shown Wildrose in front, while these other polls are now (almost) all showing them in third. If Mainstreet puts them third, that would be a strong indication that they really have lost all momentum and are in reverse. Are we seeing the possible end of the insane ultra-right Conservatives here and by extension the rest of the country ??? And the beginning of extreme left wing rise? Extreme left? where's that? who are they? If I've learned anything from movies it's Good always triumphs over Evil. In October Trudeau will be pushed back to the gates of Mordor where he belongs! We're not going to get a surprise like 2012 because the election isn't happening after a long weekend this time. We'll see a poll done over the weekend. We'll see a poll released on Monday. We'll get a late glimpse of the political landscape, something 2012's timing prevented. Notable that this predicts that strategic voting on the right will be required to prevent an NDP majority! For the first time we voted NDP – not so much in support of Rachel N (although she did well in debate etc) but rather as an "anyone but PC" vote. Come Oct 19 we will be back in the Conservative column. What do people think about Jim P's future if there is an NDP majority? Will he stick around or go back to the friendly confines of the banking world, not to be seen again on political platforms? I find that an interesting opinion. So you're voting NDP as a show of discontentment with the PCs but will still vote Tory federally. Would you mind expanding on that from a personal perspective? Both in terms of the why and why not. Why NDP and not WR if you identify as conservative, is it just a riding issues. Why still Conservative federally if they the PCs (and WR for that mater) are so closely linked policy wise, why not NDP federaly if you're looking for change. Is it personal, social, fiscal? 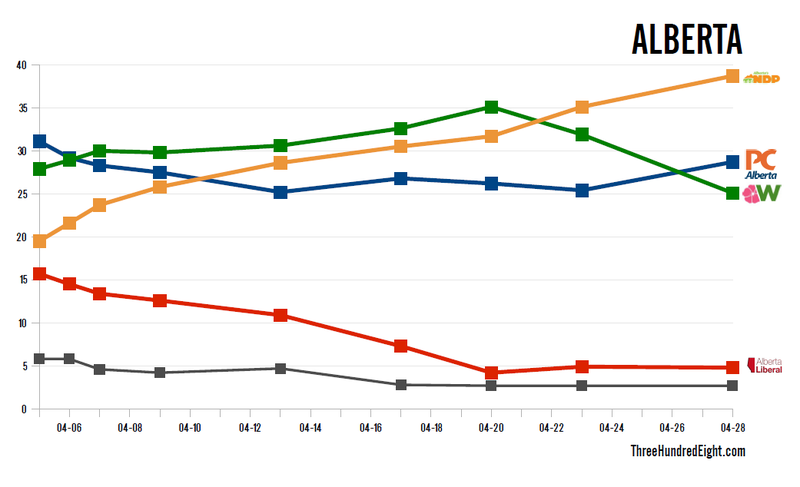 If the results are as the average predicts Prentice will not stick around. When you produce the worst result in party history it is pretty much a no-brainer you resign on election night. Provincially his career is likely over but, it may be too soon to write him off totally. After all we have senators for a reason.